Hay Baler Accidents | Nashville Personal Injury Lawyers The Law Offices of John Day, P.C. Hay balers are one of the most dangerous implements on a farm. Just as the name implies, a hay baler cuts, rakes and compacts bundles of hay into manageable and movable bales. The bales vary in size and can be round, rectangular, silage or haylage bales. Crushing injuries -- A large round bale of hay can weigh up to 2,000 lbs., which is about the same weight as a small motor vehicle. A person can easily be crushed or suffocated by a bale as it is released from the machine or if it is stored improperly. Lacerations and Amputations -- A baler can pull crops in at a rate of 4.4 feet per second. If the baler lacks adequate guarding, an operator's hand and arm can be pulled into the machine before the operator has time to react. Tractor roll-overs -- The weight and geometry of the hay bale can cause a tractor to rollover under certain conditions. 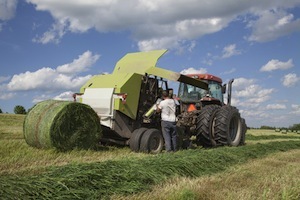 To prevent hay baler accidents, equipment needs to be well-designed and properly guarded. Appropriate instructions and warnings also need to be provided by the manufacturer. Proper training is also essential. If you or a loved one has been injured in a hay baler accident, you may be entitled to compensatory and punitive damages. To discuss your case with one of our award-winning lawyers, contact us online or call us anytime at 615-742-4880 or toll-free at 866.812.8787 for a free, no-obligation consultation. Our experienced attorneys handle all hay baler accidents on a contingency basis which means we only get paid if we recover money for you.